It is rare to see a Japanese woman in anything but tip-top preened perfection in the (non adult) media anyway. 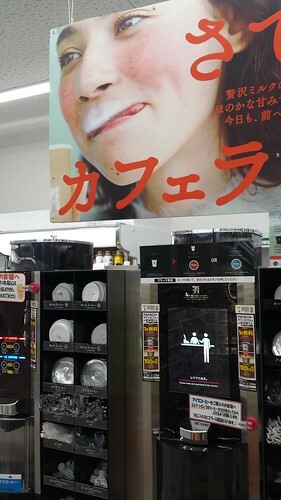 But Ms. Miyuki Emond appears to be happy to pose with with her tongue showing, presumably about to lick milk froth on her top lip in the caffè latte advertisement poster shown above Seven Eleven's coffee vending machines. A female Japanese university student once left my English class in tears when I asked her to poke out her tongue just a little to pronounce the sound "th" of "froth". I am now very sorry. It was too personal and imperfect a disclosure to demand of a Japanese lady. Ms. Emond is half Canadian. Japanese opinions of the poster and television commercial are divided with some Japanese even expressing displeasure regarding her mouth. This is hardly surprising in a Japanese context bearing in mind that female expressions of desire have been taboo since the beginning of the Japanese world. In the Japanese creation myth Izanami (female) told Izanagi (male) that he was "a fine man" or words to that effect. The child born as a result of their union was boneless like a jellyfish and floated away out to sea. It was afterwards ordained that the male should invite the female and not the other way around. Japanese ladies have been saying “no,” hiding their desire, and the inside of their mouths, ever since. At least that is, until Ms. Emond showed her tongue.